As you can probably tell I’m a little bit in love with Vietnamese food at the moment. It’s simple and packed with fresh herbs so it feels healthy and delicious. It’s also fun to assemble. The only catch is it does involve quite a few ingredients and most of them need to be very fresh, so this is more of a weekend ‘project’ cook but it’s fun and you could make a dinner party of it. 1. Prepare the dipping sauce first by pounding the garlic, chilli and sugar in a pestle and mortar to a paste. Add the peanut butter and pound a little more to break up the bigger pieces of peanut. Then add the rest of the ingredients, mix thoroughly and set aside. 2. For the rolls firstly prep the filling ingredients by slicing the cucumber and spring onions into 2 inch length fine slices. Tear the herbs up into small pieces and cut each lettuce leaf in half. Lay all the ingredients out so you can easily access them (like below). 2. Cook the noodles until soft through, drain and run cold water through them to keep them fresh. 3. In a small frying pan, lightly fry the prawns with a drizzle of soy. A few minutes should do it. Once cooked leave to cool for a few minutes then with a sharp knife, cut each prawn in half down the back, lay out with the rest of the ingredients. 4. Now in a large pot heat some warm water, leave on a very low heat (you’ll need to dip your fingers in so you don’t want it too hot). 5. Cover a chopping board with a clean dish cloth, lay it flat on top and tuck it under. 6. Take one of the rice paper wrappers and fully submerge it in the warm water in the pot. Leave it in until you can feel it’s completely softened. 7. This is the tricky part, carefully remove it from the water and lay it out fully without letting any sides stick. 8. Take 3 of the prawn halves and lay them in the middle of the paper cooked side down. 9. 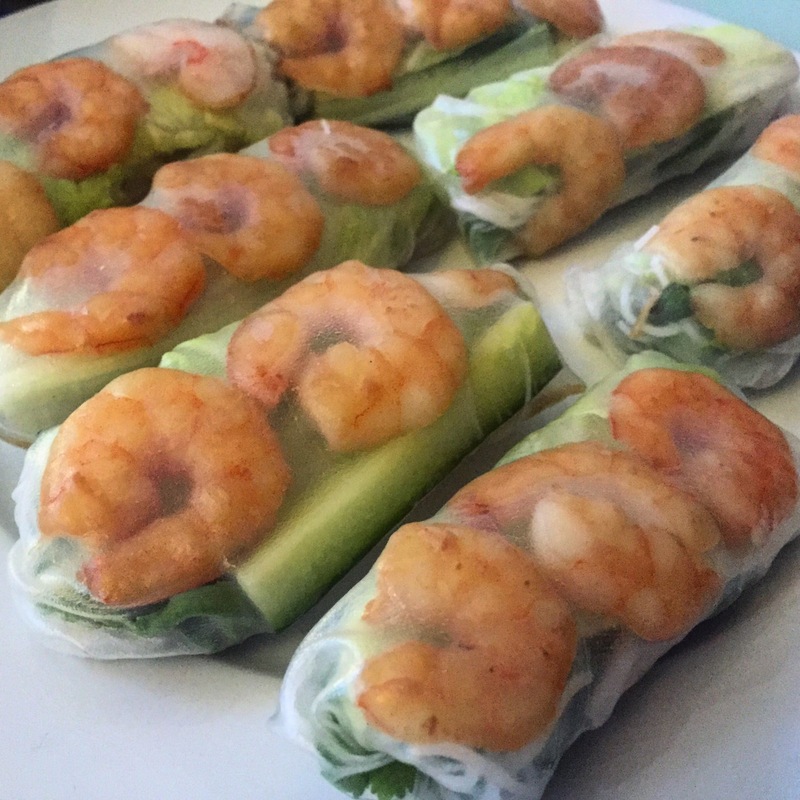 Take a piece of the lettuce and lay it on top of the prawns and use it as a kind of ‘container’ for the rest of the ingredients. 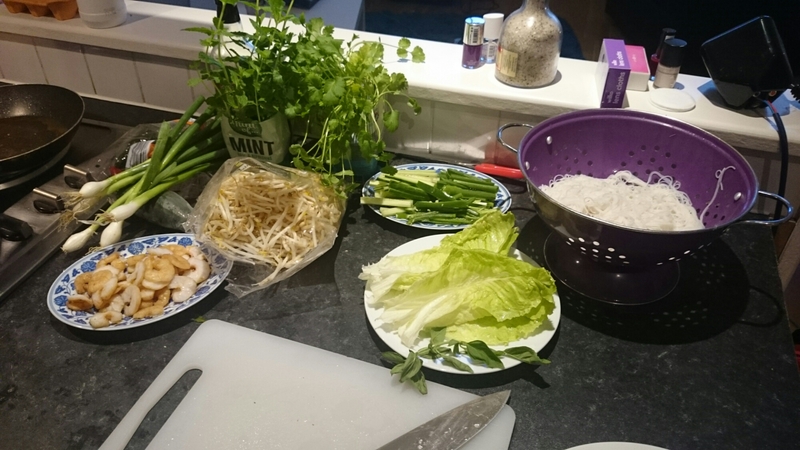 Take 2 pieces of cucumber and spring onion and place them on top of the lettuce with a very small handful of noodles and beansprouts and a few leaves of each of the herbs. 10. To finish the roll, tuck the two sides over the fillings and carefully roll the wrapper over the filling til it sticks to the other side and completes the roll. This is a good guide on how to roll them. Enjoy with the dipping sauce. Perfect guiltfree summer food!